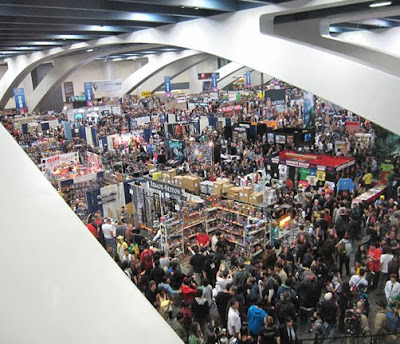 A quick report on my trip to the WonderCon comics convention in San Francisco yesterday. As I mentioned on my Facebook page (why oh why won't you be my Friend? ), I was accompanied by my staff of digital art assistants who helped color Whatever Happened to the World of Tomorrow--that is, my daughters Robin and Laura, and their friends Kelly and Kristen. Photoshop wizards all. For some reason, my wife Karen preferred to spend her day in downtown S.F. in places like Macy's. Yet somehow our marriage works. WonderCon is a nicely scaled-down version of the San Diego Comic-Con International, run by the same people so you know it's done right. It takes up a lot less floor space--maybe one-fourth as much?--but, as the photos above and below suggest, can get every bit as crowded. 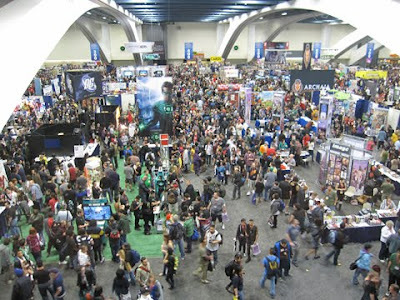 Hollywood is a much smaller presence at WonderCon than Comic-Con, which is fine by me and a lot of other comics fans who in San Diego sometimes feel like gate-crashers at their own party. And of course WonderCon is on my home turf, about an hour away, making it a fun half-day getaway instead of an expensive multi-day odyssey. I think it has become my favorite comics-related event. * I've joked in previous trip reports that no matter where or what size the convention, you can always count on seeing two people: Peter Mayhew, who played Chewbacca, and Lou Ferrigno, TV's Incredible Hulk. It was true again yesterday. Both showed up to sell photos and autographs, and for ten or twenty bucks you could have your picture taken with them--an opportunity I have never had any interest in availing myself of. However, I happened to be walking down their aisle when Mr. Ferrigno himself thrust a Polaroid camera into my hands and very politely asked if I would take a photo of him with a fan. 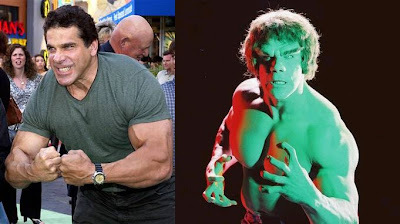 Mr. Ferrigno is still in very good, very imposing physical condition. When Mr. Ferrigno asks you to do something, the word "No" flees your brain to enter orbit around a distant star. I still do not have a photo of Lou Ferrigno and me; however, some fan out there has a photo of Lou Ferrigno and her taken by me. Which to my mind is just as good. * I've also said in other trip reports that I can always count on meeting at least one really cool person I had no idea I was going to. 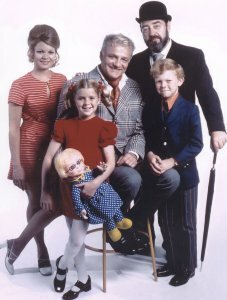 Yesterday's was Kathy Garver, who played Cissy on the old TV program "Family Affair." She was sitting at a booth (just down the aisle from Ferrigno, I think), said "Hi" as I passed, and we had a nice, genuine conversation that lasted several minutes. We talked about graphic novels--she wasn't quite sure what they were but had heard from a business consulting expert that they were the next hot thing, and I explained why I was particularly happy to hear that. It was a little strange to unexpectedly meet someone I had a small boy's crush on 40 years ago, but it was neat and she was very gracious (Jim O'Kane, you should interview her for TV Single Dads). Back in the day: Garver as Cissy on the left. Even as a child, I had good taste. 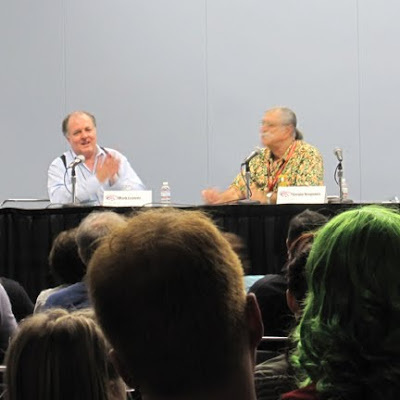 * I went to one panel, a free-wheeling exchange by writer Mark Evanier (whose blog is a daily stop of mine) and cartoonist Sergio Aragones. Mark and Sergio have worked together for 40 years, most notably on a funny barbarian character named "Groo," and through countless convention appearances have polished their comedy act to laid-back brilliance. I've met Mark a few times but believe I am the only person remotely connected to cartooning, comic books, comic strips, or crayon eating who is not a close personal friend of Sergio's. Everybody knows him, everybody loves him. Someday, Sergio. Someday. The blurry comedy stylings of Evanier and Aragones. Yes, that young woman had green hair. Why do you ask? * I was happy to see some people I knew manning a booth for the Charles M. Schulz Museum & Research Center. I think they were happier to see my daughter Laura, who volunteered there a while back and evidently left a good impression. * I said hello to Paul Guinan and Anina Bennett, whose very good and clever book Boilerplate is slated to be made into a movie by J.J. Abrams. I'd introduced myself to them at last year's San Diego Comic-Con and we have the same publisher, so had that to talk about. Nice people and I'm very excited for them. * I almost bought a lot of things but actually walked out the door with only two purchases, both books. One was The Looney Tunes Treasury by Andrew Farago, curator at San Francisco's Cartoon Art Museum (just down the street from the convention) and a friendly acquaintance. It is an absolutely gorgeous book that belongs on the shelf of anyone who can't help singing "Kill Da Wabbit!" whenever they hear Wagner. Get it even if you're not lucky enough to buy it autographed from the author himself, as I was. 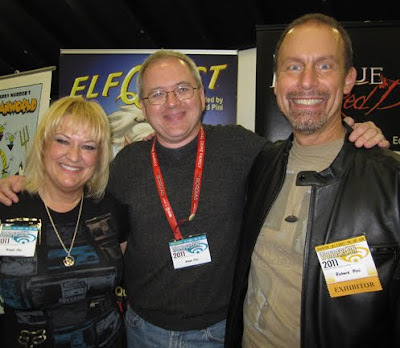 * Finally, the highlight of the con for me was finding Richard and Wendy Pini, who in 1978 created the pioneering self-published series Elfquest and have continued to build that fantasy universe and create others ever since. My second purchase of the day was Wendy's Masque of the Red Death, based very loosely on the Poe story. I look forward to reading it. I started corresponding with Richard when he read and liked WHTTWOT, met them in person at last year's WonderCon, and reconnected this year as friends. We talked books, movies, business, our future projects . . . Very nice people, very generous sharing their time and experience. I also got to watch them interact with some of their fans, and its hard to imagine any fans being more respected or appreciated. We also talked about their efforts to drum up enthusiasm to get an Elfquest movie made by Warner Brothers, which optioned the film rights. Seems like a no-brainer to me . . . .
Wendy and Richard Pini. Coolest of the cool. Also saw a lot of other people, comics, original art, merchandise and cosplayers, but I promised quick; that's about it. Good people, good stuff, good day. Brian, I tried to interview Ms. Garver several years ago, when The WB Network built their odd revival Family Affair series at the beginning of this century (Tim Curry as Mister French?). She was a guest star as Buffy's teacher in the new series, but for some reason the show publicist thought it would be a horrible idea for Kathy Garver to talk to me about either incarnation of the show. Someday, maybe I'll bump into her at a con and get some closure. Meanwhile, I did score a short, sweet interview with her TV brother - who grew up to look *exactly* like Brian Keith! Don't know what you mean, Jim; when I think warm, cuddly, avuncular, and the complete opposite of darkly twisted in a disturbing psycho-sexual way, the first name that comes to mind is Tim Curry. Anyway, give Ms. Garver another try sometime. I think she'd be a good interview, particularly regarding Brian Keith. Oh wow. I want to see the Tim Curry version. Tim Curry turned in a surprisingly good performance. His Mister French was more of an acerbic Alfred the Butler portrayal than the put-upon Sebastian Cabot model. If I can dig up the ancient demo tape The WB sent me, I'll try and post a clip.